Come see the world premiere of �DRIVE� at the Showbox SODO in Seattle, WA. One night only! DJ Niros will be spinnin� all night to keep things going. 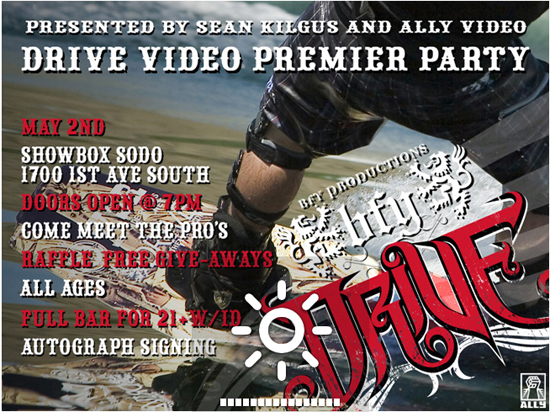 Come mingle with all the riders featured in the video � an autograph signing will follow the film! RAFFLE TICKETS WITH BE SOLD FOR A CHANCE TO WIN ONE OF THE RIDERS� PRO MODEL BOARDS�SIGNED - AND WE HAVE A MOUNTAIN HIGH PILE OF GOODIES TO THROW OUT!!! This film was pretty sweet. I’m glad I went, I ended up winning Rusty’s autographed Marek board. So stoked.